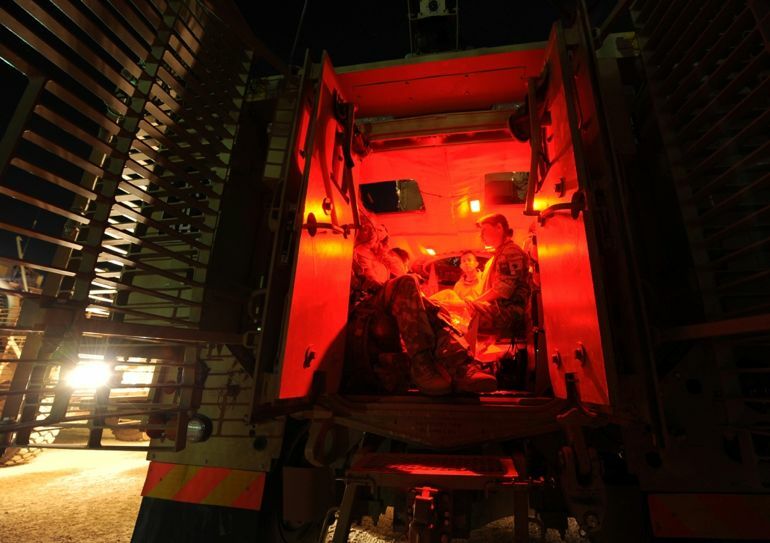 Private Jess Cheek of 12 Logistic Support Regiment (12 LSR) writes about going on her first few convoys in Afghanistan. Welcome to this brand new blog. It has come about a bit late in the tour (we arrived in Afghanistan mid-march), so this post is a bit of a catch-up to fill you in. I’m a Communications Specialist working with Force Protection Troop (FP Tp), 6 Squadron, 12 Logistic Support Regiment (12 LSR). Our troop provides internal protection for the convoy (external protection being provided by Vikings, air support etc). Back in the day this role was filled by the infantry but we provide our own force protection now. Currently I’m the only female in FP. When we first arrived into theatre, we went straight into an 8-day training package designed to make sure everyone who deployed was up to scratch with their skills and drills. The most enjoyable part of this was the Counter-Improvised Explosive Devices training. The Army is always adjusting its best practices as a result of lessons we learn during operations, therefore sometimes the way we train back in England may not always be current, and it’s important to continue training even whilst we are out on operations. Our first mission was to Forward Operating Base Edinburgh, Musa Qal’a. It was a joint effort with the Americans and turned out to be the biggest Combat Logistic Patrol (CLP) conducted in Afghanistan so far. (See the article “Week-long patrol resupplies Musa Qal’ah” on the MOD website). For many of us (myself included), it was our first time out on the ground. We had done many CLPs back in the UK during our pre-op training but I don’t think anything can really prepare you for that first contact situation. Our next two CLPs were to FOBs in Sangin, the first of which was pretty interesting. We had a couple of incidents involving Improvised Explosive Devices but thankfully no one was seriously injured. Our troop commander did have a bit of a fall as a result of one of the blasts and as a precaution we had him evacuated by an American helicopter. The speed at which the medical helicopters operate is really impressive and it certainly gives you reassurance, knowing that a helicopter can get to you if you are injured in minutes. Fortunately Our ‘Troopy’ only suffered a few bruises, mostly to his ego. The third CLP was less eventful. We had the ANA partner us on this CLP, which was interesting. The ANA have a very different way of working to us, and their customs and traditions are very different to ours, but they worked just as hard as we did throughout the operation. That’s the story so far. Life in Camp Bastion is pretty good. I hope to put together a post about it and a series of photos showing its facilities so people back home can see how we live on camp. Corporal Simon Leigh of 12 Logistic Support Regiment (12 LSR) describes how hard it is to leave home to go to Afghanistan. 9 March 2010: Sitting in RAF Brize Norton trying to get the internet to work. Really hate airports. I just started to fall asleep when there’s a familiar shout: “All those boarding flight RR4405 to the ‘Runner Up’ destination called Afghanistan, please have your boarding cards ready.” I said goodbye to the wife on Facebook and realised this was where it all begins! Sometimes I wonder why I bother doing this? Then I remember 9/11 and 7/7 and I realise it’s my duty to help prevent these tragedies happening again. My main role as a Driver in 12 Close Support Logistic Regiment (CSLR), Royal Logistic Corps (RLC) is to provide real life support to the brave frontline soldiers of the British Army and other coalition forces. Throughout this blog I will try to paint a picture of life as a soldier within 12 CSLR on Operation HERRICK 12.